Cool your coffee faster and keep enjoying it longer with Joulies, stainless steel beans filled with a magic heat-absorbing material. 4,818 backers pledged $306,944 to help bring this project to life. Many thanks to all our backers for your support!! If you missed out on our Kickstarter campaign head to Joulies.com where you can sign up to be notified as soon as Coffee Joulies are available to order. You can also follow us on twitter @coffeejoulies and on facebook.com/coffeejoulies to stay up to speed on our activities. Hey Kickstarters, thanks for checking out our project! We have spent the last nine months developing Coffee Joulies to create the perfect coffee drinking experience for you, and now we need your help to get them produced. Coffee Joulies work with your coffee to achieve two goals. First, they absorb extra thermal energy in your coffee when it’s served too hot, cooling it down to a drinkable temperature three times faster than normal. Next, they release that stored energy back into your coffee keeping it in the right temperature range twice as long. This amazing feat of thermodynamics happens thanks to a special non-toxic material sealed within the polished stainless steel shell. This material is designed to melt at 140 degrees Fahrenheit, and absorbs a lot of energy as it melts. This is how Joulies cool your coffee down three times faster than normal. Once it reaches this temperature, the special material begins to solidify again, releasing the energy it stored when it melted. This is how Joulies keep your coffee warm twice as long. The better insulated your cup, the better Coffee Joulies work. Simply using a lid goes a long way. This is because less heat is lost to the environment, and more is stored within the Joulies themselves. In a ceramic mug Joulies will keep your coffee in the right temperature range for only a few minutes longer than usual (because mugs are such poor insulators - designed to keep your hand from being burned, not to keep coffee warm). Of course this isn't a problem when you're rushing to get to work in the morning and Joulies help you drink your coffee three times sooner. In a well-made vacuum thermos, on the other hand, Joulies will keep your coffee in the right temperature range for over five hours. More importantly, they cool coffee down much faster, helping you avoid burning your tongue as you taste coffee in the thermos while checking to see if it’s the right temperature yet. Oh, and did we mention that Coffee Joulies work with more than just coffee? You’ll love Joulies in your tea, hot chocolate...any hot beverage you want. Remember, coffee is more than just a hot, caffeinated beverage. It is a ritual that gets us up in the morning and keeps us going all day. Get creative with how you incorporate Joulies into your ritual. Find out exactly how many you need for your perfect cup of coffee, when to put them in, whether you want to preheat them first, whether you still need cream and sugar once you have the temperature perfected with Joulies, etc. etc. These are your magic beans now. Get to know them. You’ll have them forever. 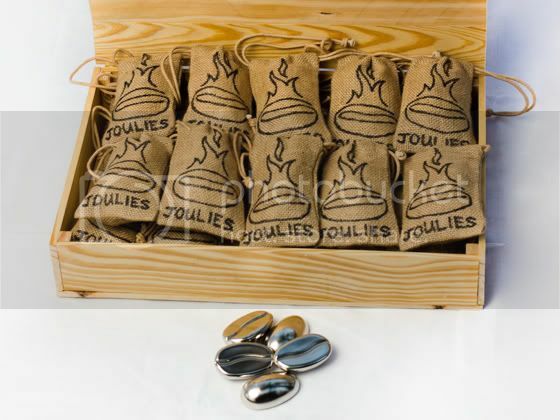 Personal Pack: Pre-order your very own set of five Coffee Joulies packaged in a reusable carrying pouch for a discount of 20% off the $50 retail price. 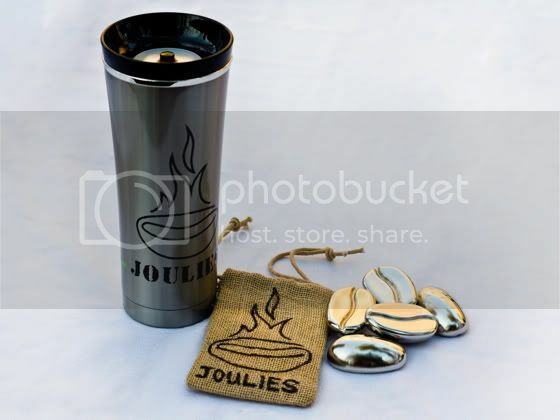 Enthusiast Pack: For this you'll get a set of five Coffee Joulies, a Thermos Sipp travel mug with the Joulies logo and "I backed Joulies on Kickstarter" printed on it, and your name listed on the website as a backer. Coffee Shop Pack: Pre-order a box of 20 sets of five Coffee Joulies, each packaged for resale in a jute carrying pouch. This is also great for budding entrepreneurs who want to sell Joulies themselves, and for people who want to get their birthday, anniversary, and holiday shopping done for the whole year with one purchase. Pop a few Joulies into your coffee as soon as it’s poured. The hotter the coffee, the more energy Joulies can absorb, and the longer they can keep your coffee the right temperature. Yes! Joulies are perfectly safe when used properly, and in fact make drinking coffee safer than usual by reducing the risk of burning your mouth. They sink in your coffee to keep them away from your lips, they won’t ever be hotter than 140°F when used properly (meaning they’ll never burn you), and all the materials used in their construction are food-grade. Each Joulie is made to work with 5 ounces of volume, so put one in your double espresso, two in your mug, three in your tall coffee, four in your travel thermos, and five in your venti. 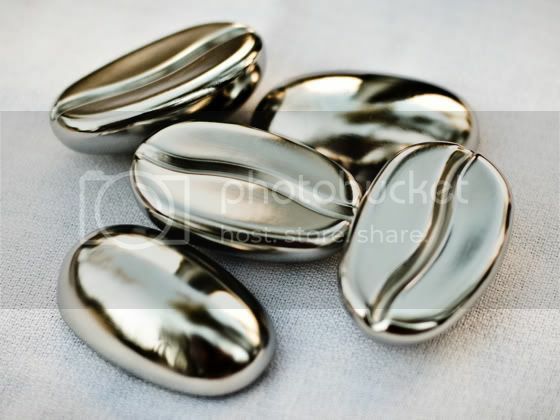 Joulies are made of the hightest grade stainless steel used in silverware production, ensuring that they are completely safe, will last forever, and will keep their polished finish for a long time. 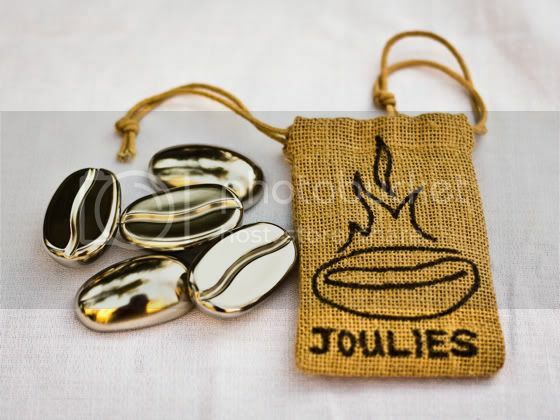 Joulies are filled with a proprietary substance called a “Phase Change Material” (PCM) that melts at 140°F and is 100% edible food-grade magic. Coffee Joulies are made using the same materials and a very similar process as table knives, and will last a lifetime. How much space do Coffee Joulies take up in my cup? Joulies take up about 15% of the volume of your cup or thermos. This is about the same volume you’d use for cream. Coffee Joulies can still work with coffee that has cream in it, but you’ll have to experiment to find your preferred method. You can use extra hot coffee, preheat the cream as if you were making a latte, preheat the Joulies, use fewer Joulies, or use less cream. Personally, I began using cream in my coffee when I was young just to cool it down, and now I’m moving back to black coffee with Joulies, which is the best way to appreciate the subtle flavors of gourmet beans. 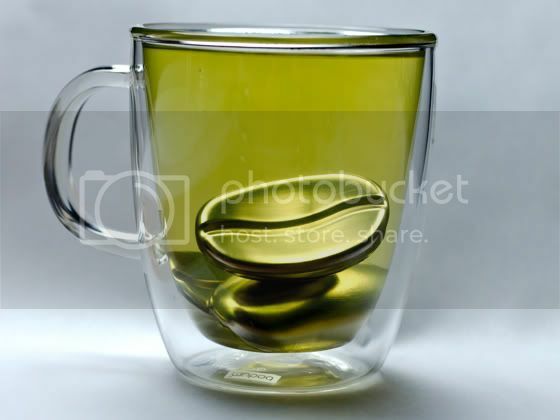 Why should I use Coffee Joulies instead of some other way to cool my coffee? Joulies ensure that your coffee only cools down until it reaches the right temperature. At this point the process reverses and Joulies begin releasing the heat they absorbed back into your coffee to keep it hot longer. Ice can cool your coffee down, but it’s easy to cool it down too much. Plus, ice waters down your coffee and doesn’t store any energy to keep it hot longer. Cream can cover up the subtle flavors of coffee, and also can cool your coffee too much and doesn’t store any energy. You could just wait, but who has time for that? Plus, all that energy is disappearing into the environment instead of being stored to keep your coffee hot longer. Joulies can be cleaned in the dishwasher just like the rest of your silverware, though most of the time simply rinsing them off is plenty. When will I get my set of Coffee Joulies? Your Coffee Joulies should come to you within 12 weeks of the project reaching its funding goal. It can take up to 8 weeks just to make the dies for stamping out the stainless steel shells. Stamping dies are more complicated than the typical plastic injection molds you see on here a lot. These dies need to be machined, polished, tested, then remachined and polished again to make sure the parts come out perfectly every time. The manufacturer is already working on the production process, and will begin cutting the dies as soon as our funding goal is reached. The more orders we have, the more time the manufacturer can dedicate to our project and the faster these can be completed. The best way for you to help is by backing our project. If you believe in Coffee Joulies enough to invest, feel free to purchase as many Coffee Shop boxes as you’d like and begin selling Coffee Joulies yourself!! Who are the creators of these magic beans? Creator Q&A: Dave & Dave from Coffee Joulies.